The planning and design of coastal structures ( harbours, breakwaters, shore protections etc) requires to have full knowledge about local waves, currents, winds, water levels and sediment transport. This is sometimes even more vital than the geological survey in area in question. The information about wave climate will be used to design cost-effective and reliable solutions. We are offering these services with our partners in Lainemudel Ltd and Laboratory of Wave Engineering (https://wavelab.ioc.ee/) of Tallinn University of Technology (TUT). They use site measurements, modelling, different studies of documents and scientific literature in their work to come up with the best outcome to client. Output from SWAN (wave model) results. Analysis of wind measurements. Wind measurements are analysed for different directions to calculate various parameters and wind speeds with certain return periods. Results are validated and compared with previous studies. 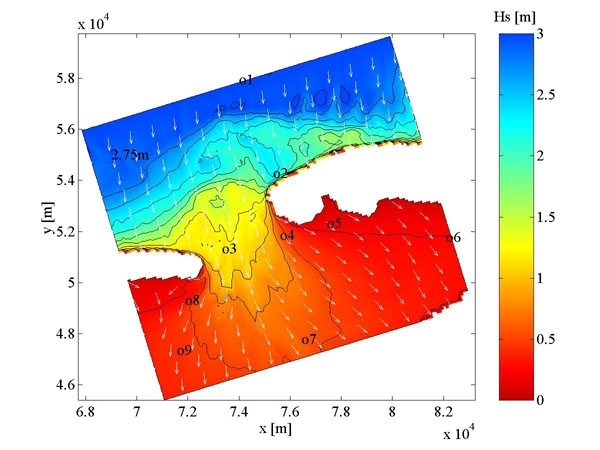 It is required for modelling currents and wave propagation. Analysis of water levels on the basis of measurements, scientific literature and numerical simulations. It may be supplemented with the values of wave set-up. The results are given with certain return period. Calculation of significant wave heights and periods with parametric models or SWAN (spectral wave model). Analysis of wave climate. It is possible to assess different configurations of harbours and heights of breakwaters and quays. Joint distribution of wave heights and water levels are assessed for different sites. The representation of results depends on the assignment, but the most common is the output of parameters with specific return periods, which are required for the design of maritime and coastal structures. Assessment of transport of suspended sediment transport. Depending on the assignment different approaches are used. Analysis of coastal process on the basis of scientific literature, observations, measurements and modelling. The impact of present and planned structures on the environment is also assessed.